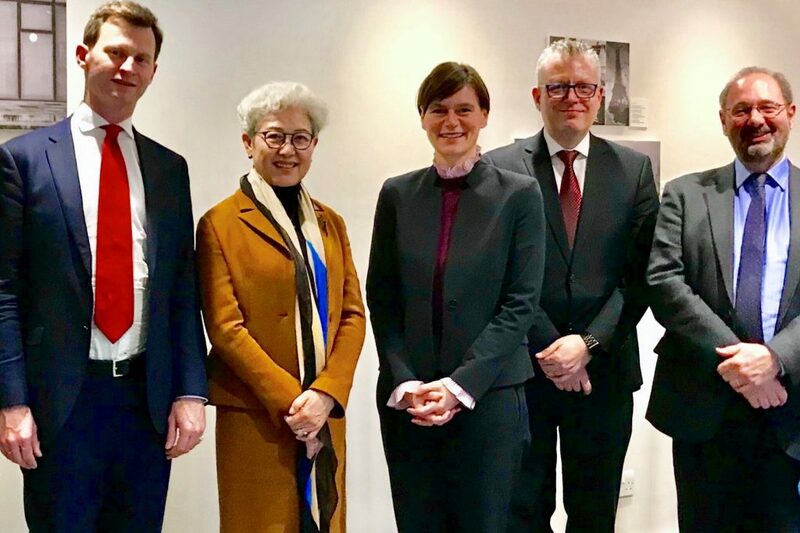 The School of Politics and International Relations welcomed Madame Fu Ying, Vice Chairperson of the Foreign Affairs Committee of the National People’s Congress of China, to its Canterbury campus on 5 December. She was greeted by University Vice-Chancellor and President Professor Karen Cox and Dean for Internationalisation Dr Anthony Manning. Professor Richard Sakwa, of the University’s School of Politics and International Relations (POLIR), hosted the visit. Madame Fu Ying studied at POLIR in 1985 to gain an MA in International Relations. She received an honorary Doctorate of Civil Law from the University in 2008. During her visit she delivered a research seminar to students at POLIR entitled China and the World, as well as touring her former School, accompanied by Head of School Dr Adrian Pabst. He also explained that Madame Fu Ying had shown particular interested in Kent’s recent Think Kent Global Showcase events in Beijing and Shanghai, which took place in November 2018. Madame Fu Ying, who was China’s Ambassador to the UK from 2007-10, agreed to donate copies of her latest books, entitled The world as I see it and Face to face with you – the stories behind the press conferences, to the Templeman Library, as well as providing signed copies for students.